You’ll recall about this time last year I was honoured to join the OSI Board and expressed hopes OSI could move towards representative governance. 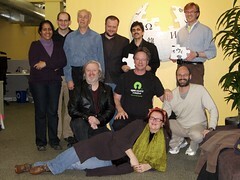 Well, I spent the weekend in San Francisco at an OSI Board face-to-face meeting (kindly hosted by the Wikimedia Foundation) where we finally agreed to move towards representative governance and also elected a stellar group of new Directors. Read about it on ComputerWorldUK or the OSI Board Blog.